The Wild Inside: A Busy Day! 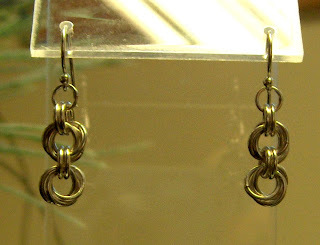 These are the earrings that go with the flower weave bracelet. They're amazingly light. I do believe I need to work on my camera skills .. either that or pull that light cube out and start using the thing : ) The picture really doesn't do them justice. 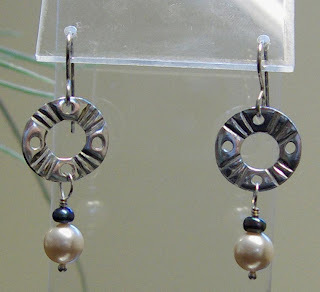 The earrings below are another of the finished PMC pieces I posted a week or so ago. I left these out to dry naturally and experimented with carving the PMC with small and delicate wood carving tools. I was afraid I'd put too much pressure on the piece and break them; but they were pretty sturdy in that stage. I kinda liked the carving aspect versus impressing a pattern into the clay while it's still wet. I had them tumbling with a bunch of rings I used in the spiral bracelet below, and just added the hand made earwires and dangles this afternoon (the dangles are an 8mm creme rose Swarovski pearl and a peacock blue freshwater pearl on a fine silver headpin. The pearls add a little elegant contrast to the primitive look I was shootin' for with the PMC portion. And, of course, after firing, the PMC becomes pure silver, fine silver, .999. Again, very light weight. This is new chain maille weave for me .. tried it for the first time today. We lost power for a couple hours during a snow/sleet storm while I was working on it, so no radio, no tumbler, no computer, no nuthin'. It was VERY quiet. I almost wished I'd picked out a little more difficult weave for this time when it was so very easy to concentrate! Again .. my photo skills need work, I know. It's a continuous circle .. no clasp. You roll it onto your wrist. I was skeptical at first .. thought it might be too big if you had to put it on that way. Not the case .. it was perfect! Well, for me anyway. I'll have to make others another half inch to an inch larger. And while it was a real easy weave .. I understood the pattern quickly and was bopping right along .. the ending was a bit tricky. In fact, I'm certain I didn't get the last two connecting links quite right. Before adding the last two connecting links, you must tighten the twist just the right amount. Too loose, and the spiral pattern won't hold, too tight and it kinks up on itself. So .. not so easy after all. I'm wearing it at the moment, however (it really is a pretty little thing! ), so I'll go back and get it right first thing on Monday. And I'll try to get a better photo of it at that time ; ) Promise. I just had to come right over here and check you out! I think we have met, possibly at the Remington "Amatuers Only" opening? Anyway, it was a delightful surprise to find your comment on my blog, and it's equally delightful to have a close look at your jewelry. Beautiful stuff! The North Country is home to many amazing folks; it's a foreign world to most of the people who visit my blog. I love sharing what's special about our little corner of the woods with them, and it's wonderful to connect with a "neighbor" and kindred spirit. I have another blog that is not "public." It features the poetry of another North Country woman and some of my photos. I'd love to have you take a peek sometime. I'll be back to spend some time poring over your site and getting to know you better.